Need a break from interstate driving? 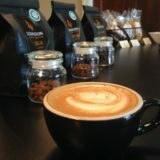 Watch us roast while enjoying classic espresso drinks, brewed-to-order coffees, locally made bagels and cookies. Learn about coffee from our Self-Guided Tour. Get a brewing lesson from our knowledgeable staff. Or just relax. We have a large lawn with outdoor seating and dogs are welcome! Open Monday - Friday 8:30am - 4:30pm.